Pam and Robert Bryant were looking for a new house back in 1993, but were a little surprised when their realtor took them to an old train depot. It was over their budget and not what they were looking for, but they ultimately bought it. “We stayed two hours looking at it,” the couple told TODAY Home. 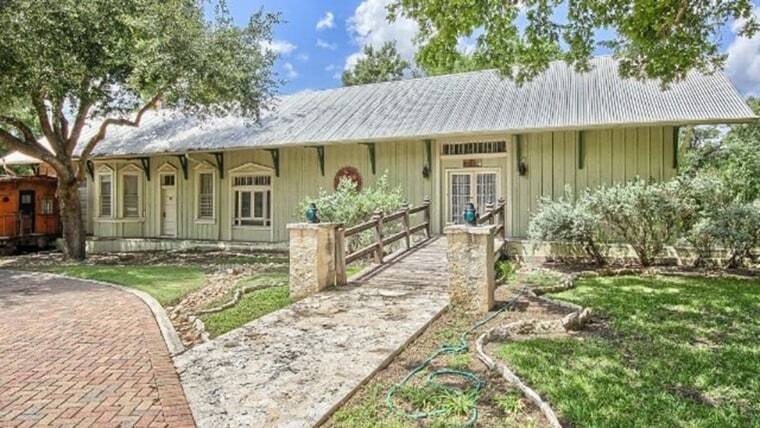 The Missouri Pacific Depot was originally located in Buda, Texas, but the previous owners moved it to the current property and converted it into a house. At the time the Bryants bought it, the 2,000-square-foot depot only had two bedrooms. They got the idea to create three more bedrooms for their adult children by using vintage cabooses. Unconventional, yes, but the caboose rooms turned out totally charming thanks to the work the Bryants put into it. While they left the exterior of the cabooses untouched, they gutted and decorated the interiors. Furnishing the spaces was their biggest challenge. “The doors are so narrow that in order to get furniture into it, my husband built a hatch, like boats have, into the floor to open and lift things in or out of the caboose,” Pam Bryant said. In total, they added four cabooses. One is used as the couple’s office while the other three each have a sleeping area and full bath. The main home includes a light and airy living room with a tall ceiling and fireplace. In the kitchen, Robert Bryant built a wall of shelves and added an antique library ladder to get to the hard-to-reach items. There’s also a wooden island that provides an extra place to prepare food or eat. The bathroom features his-and-her vessel sinks, antique light sconces and a vintage vanity. Outside, there’s an oval swimming pool and old hunting shack that the previous owners had turned into a guest house — it includes a living and sleeping area, plus full a bath. The six-bedroom, seven-bath property is currently on the market for $2,985,001. While the Bryants have nothing but love for it, they’re parting with it because they’ve built a bigger house to accommodate their growing family of grandkids. See more photos of the train depot home at the listing.